I’ve mentioned on here before that learning to cook as a visiting chef in Barclay’s kitchen has always been– oh, shall we say — a bit of an adventure. There are always multiple reasons for this. But probably the primary difference between his kitchen and mine is that his oven hasn’t worked for a number of years. And instead of getting it fixed, he and his roommate have always happily just relied upon their 20-yr-old little toaster oven that sits on top of the counter. Works for them! But, um, cooking for a crowd with just a stovetop and a toaster oven has sometimes proved a bit of a challenge for me. So this summer, I decided it was time to dust off their grill — that’s surprisingly also rarely used — and put it to work when we were entertaining at his place. And it was so fun!! Turns out my boyfriend knows a thing or two about grilling. (And, ahem, looks smokin’ hot behind a grill!) We made a series of kabobs over the summer, and cooked up a ton of grilled veggies. 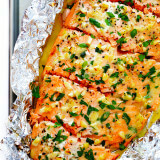 But mostly, we grilled so much of this lemony, buttery, ultra-garlicky, hea-ven-ly salmon. Seriously, like so much of it. Barclay does 100% of his grocery shopping at Costco. So whenever we decided it was salmon night, we grilled up a huge slab of it and invited friends and family over to enjoy it all together. And then chopped up tons and tons of garlic (from his, yes, Costco-sized bag of garlic) and spread it all over the top with some butter, lemon juice, herbs, and a dash of white wine to make it all the more delicious. 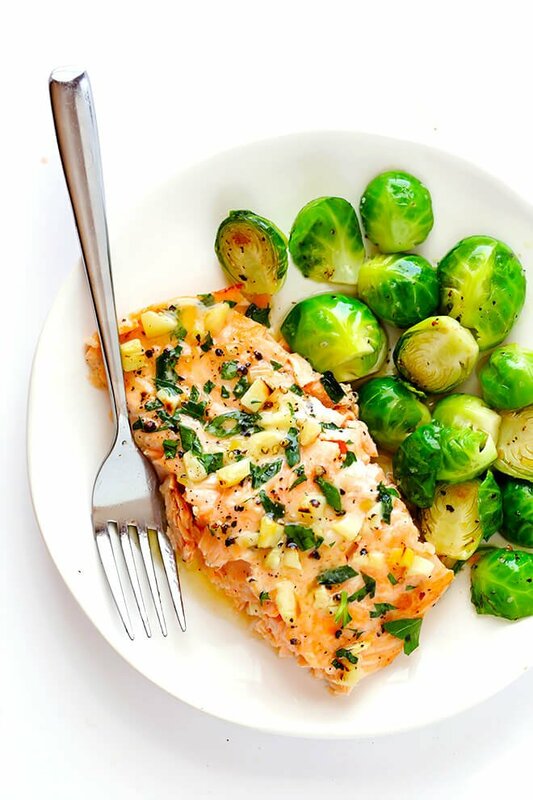 And oh my goodness, this garlic lovers salmon (as we decided to name it) was an absolute winner EVERY TIME. Since the weather has cooled off, I’ve now switched to baking this up in the oven. But either way, it’s always a crowd-pleaser, it always takes just a few minutes to prep, and it’s always so incredibly delicious. To make it, grab a sharp knife and get to choppin’. 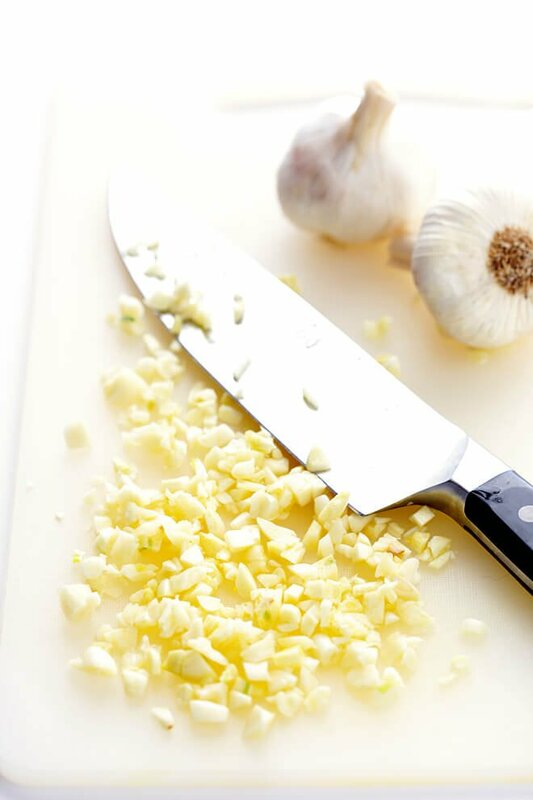 You’ll need tons of chopped fresh garlic. I recommend chopping it fairly coarsely, but if you don’t want obvious chunks of garlic in each bite, you’re welcome to finely mince it. 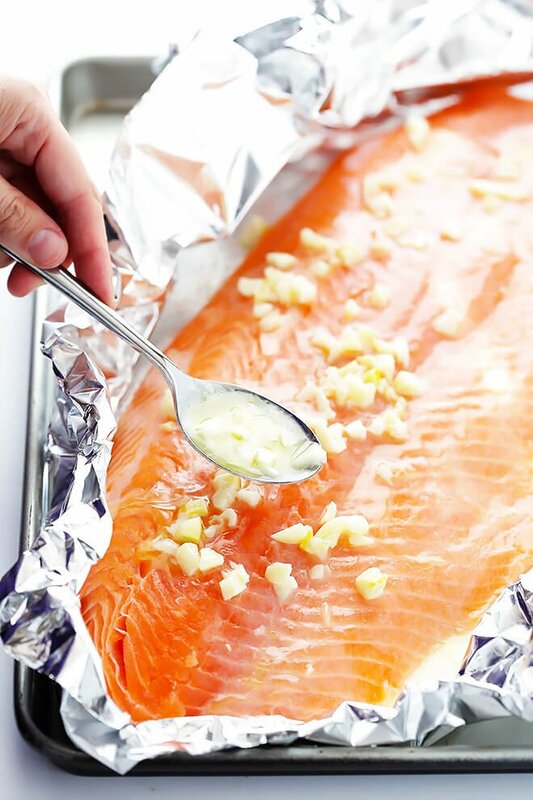 Then lay a very large piece of foil (or you may need to use two) on top of a large baking sheet, brush a little of the butter on the bottom of the foil (so that the salmon won’t stick to it), and then place the salmon evenly on top of it. Spread the rest of the butter-garlic mixture evenly on top of the salmon, and then season it with a few generous pinches of salt and black pepper. Then fold up the foil on top of the salmon until it forms a sealed packet (again, just use two pieces of foil if need be), and you’ll be ready to cook it up! You’re welcome to either carefully transfer the packet to the grill and cook the salmon there. Or you can just slide it into the oven, and then cook and broil it to perfection! Different cuts of salmon will definitely cook more or less quickly, depending on how thick they are. So keep a close eye on the salmon to be sure that it’s cooked through (and not overcooked). I like mostly cooking the salmon in the sealed foil packet until the last few minutes, when I open it up to let the top get a little crispy. But feel free to grill or bake it however best you prefer. Then, once the salmon is cooked, remove it from the grill or oven. Sprinkle on a bunch of fresh herbs and green onions, cut it into your desired size of portions, and then — voila — dinner is served. We loved serving this with grilled or roasted veggies on the side, and a big ol’ green salad (like my family’s favorite salad, this apple spinach salad, or this easy arugula salad), but go with whatever works for you. Seriously, couldn’t be easier, and couldn’t be more delicious. And — bonus — it’s naturally gluten-free as well. Hope you all enjoy this one as much as we have lately! 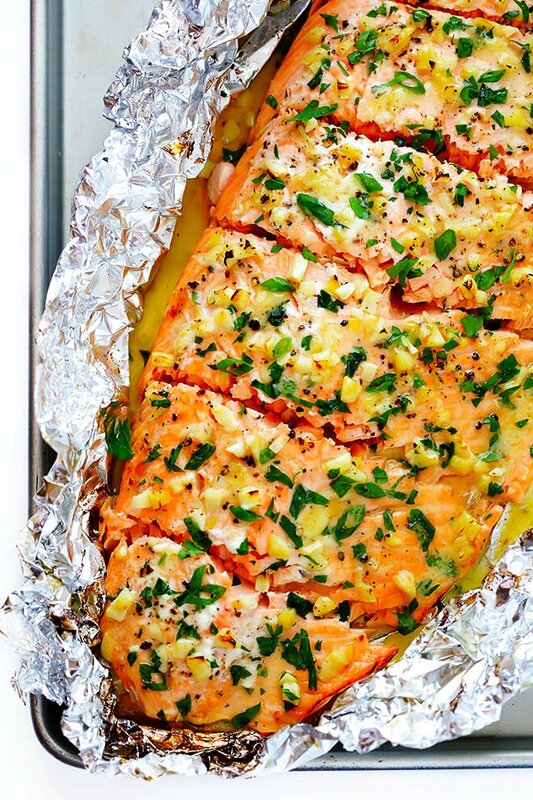 This Garlic Lovers Salmon is easy to make on the grill or in the oven, it’s cooked with the most heavenly lemon butter garlic sauce, and it’s always a crowd favorite! Heat oven to 375°F. Or heat a grill to medium heat. Line a large baking dish with a large piece of aluminum foil. In a small saucepan, heat butter over medium-high heat until melted. Stir in the garlic and cook for 1-2 minutes until fragrant. (You want the garlic to be partly- but not fully-cooked.) Remove from heat and stir in the white wine and lemon juice. Using a pastry brush, brush a tablespoons of the butter mixture on the foil until it is evenly covered. 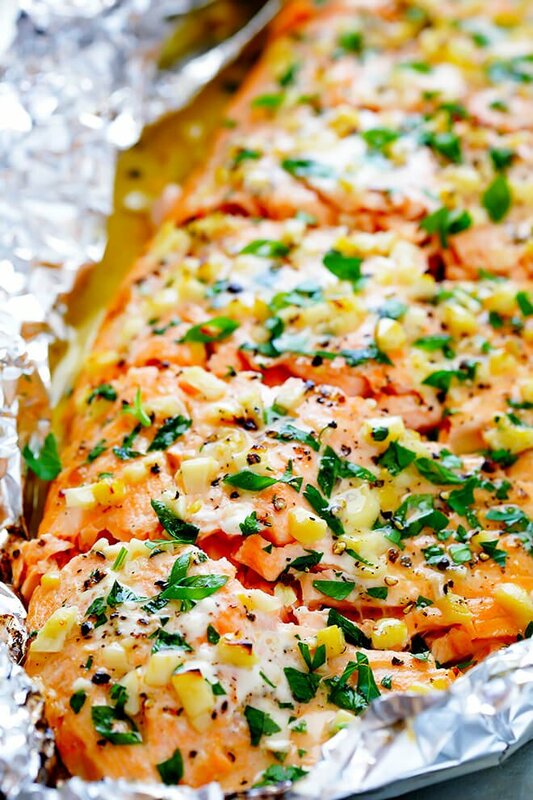 Lay the salmon out on the foil. Then pour the remainder of the butter-garlic mixture on top of the salmon and brush it around until it evenly covers the salmon. Season the salmon evenly with a few generous pinches of salt and pepper. Fold the sides of the aluminum foil up and over the top of the salmon until it is completely enclosed. (If your sheet of foil is not large enough, just place a second sheet of foil on top and fold the edges so that it forms a sealed packet. To Cook On The Grill: Carefully transfer the packet of salmon to the grill, and grill for 12-14 minutes, or until the salmon is almost completely cooked through. (Cooking times will vary on the thickness of your salmon, so I recommend checking it a few minutes early if you have a thinner cut of salmon.) Carefully open and pull back the aluminum foil so that the top of the fish is completely exposed. (Be careful, lots of hot steam will be released!) Continue cooking for 3-4 minutes, or until the top of the salmon and the garlic are slightly golden and the fish is cooked through. Remove salmon from the oven or grill. Sprinkle the top of the salmon evenly with parsley and green onions, and serve immediately. *Feel free to also sub in whatever other fresh herbs you have on hand, or use a mix! I love using parsley as a base, and then mixing in some chopped fresh rosemary and thyme too. OR, I also love just stirring in 1 teaspoon of Italian seasoning into the butter mixture, and brushing that all over the salmon.